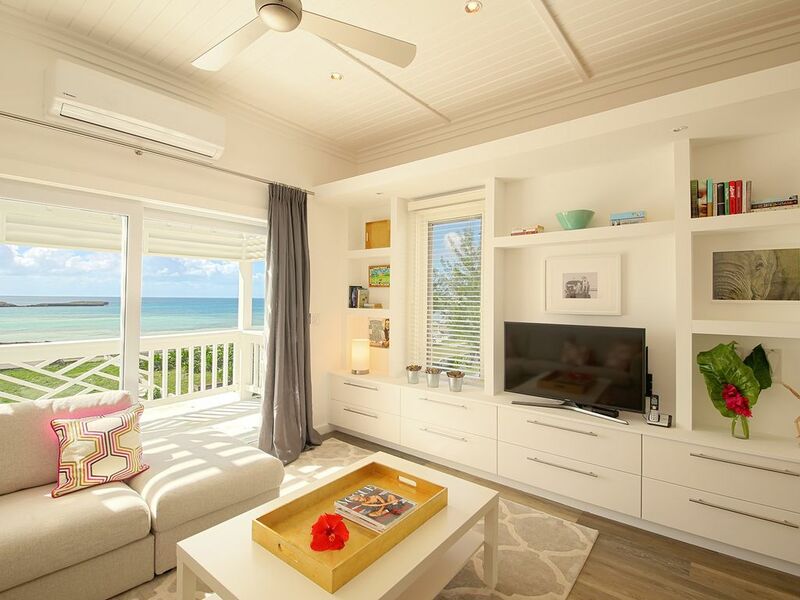 Welcome to The Governor's Collection - Anchor Point Apartments; an affordable, condo-style development located in the vibrant heart of Governor's Harbour, Eleuthera. The complex is comprised of two buildings: One contains 2 one-bedroom apartments and two standard two-bedroom apartments, while the other contains 2 larger, two-bedroom apartment suites. All units are built with covered, outside balconies that offer fantastic views of Anchor Bay. This particular upstairs apartment features a small rooftop viewing gallery - ideal for taking in beautiful island sunsets, star-gazing in the evenings, or for admiring the waterfront bay view! We are situated in a prime location for exploring Central Eleuthera. We are one block from the historic Haynes Library, and less than a 1/4 mile from Cupid's Cay, home of the Eleutheran Adventurers, and the site of the first Bahamian Parliament in 1746. Anchor Point is in walking distance to local supermarkets, banks (2 with ATMs), coffee shops, gift stores and more - But, if you want to really explore the island, it is best to rent a car. There are endless secluded beaches that travel the length of the island, just waiting to be explored! For a fun day out on the ocean fishing, we would be more than happy to help you arrange hiring a boat for the day or organizing a charter, with your own captain. Paddle boards, kayaks, and jet skis are also available for rent, as well as snorkeling and diving gear. You can also take a day excursion to visit The Swimming Pigs of Spanish Wells – a relatively new, but very popular, day tour! On Friday evenings, there's great Bahamian nightlife at the Anchor Bay fish fry, which is a short stroll from the apartments. Here you can sample locally prepared, down-home Bahamian food - including conch salad, deep fried fish, grilled chicken, macaroni and cheese, and peas n' rice. Mingle with friendly locals, winter residents who visit the island each year for several months at a time, or tourists seeking a fun evening out - there is a live DJ, local beers and cocktails on sale, limbo contests and dancing in the street until late! This is our second year in a row to stay at this property (different apartments) and we love everything about it. We always rent a car, but the apartment is walking distance to everything Governor's Harbor has to offer, which is a huge plus. Joy and Dom are great hosts and property managers and always make us feel welcome! The apartment was spotless when we arrived and it is equipped with everything you could want. Be advised that there are free-roaming chickens and roosters near the property and they do make noise. It did not bother us, but I can imagine it might be a concern for really light sleepers. We acrually found them entertaining to watch and part of the charm of the area. Can't wait to return! This apartment is beautifully appointed with all the latest appliances and conveniences you could want. Joy and Dom provided many little extras that made our stay extremely comfortable. The view and location are wonderful. We highly recommend this spot! Lovely accommodations. Would highly recommend! Outstanding design in a wonderful location! First, Joy & Dominic were incredible to work with as we planned our Eleuthera getaway and extremely helpful at all times during our stay. We enjoyed meeting them immensely and cannot say enough great things about them! The apartments themselves are beautifully decorated and maintained. Everything we needed to enjoy the island in a comfortable manner was on site and in terrific condition. From their design to the wonderful kitchen and down to the provided beach chairs it was perfect for us! Their central location in Governor's Harbor proved ideal as my wife and I enjoyed exploring the island each day. We always loved coming home to relax before heading out to dinner - the balconies and the widow's watch above the apartment are a terrific place to enjoy the beauty that surrounds the area. Don't miss the Fish Fry on Friday night - just a short walk from the apartment and a wonderful opportunity to experience a local tradition. We attended church service at St Patrick's just down the street as well and the welcome we received was one that will not be soon forgotten. Eleuthera is a magical place, its people are beyond kind and the apartments are a wonderful place to begin your experience! Brand new building. First class interior design. Perfectly equipped. Sea view from both front balconies and very nice landlords taking care of everything! We were even welcomed with ice cold beers in the fridge! Beautiful property. Excellent location. Joy and Dom are consummate hosts. A great choice. We will book again.